Two eclipses down, one more to go – plus Mars retrograde and Mercury retrograde to finish off. 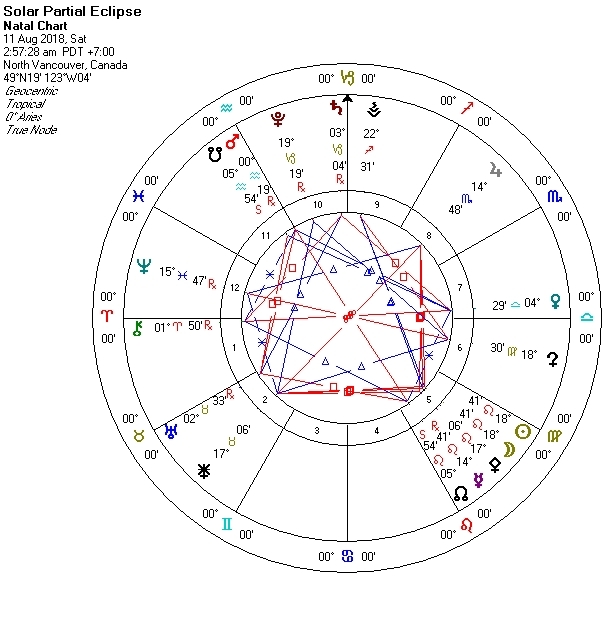 Having surpassed its closest proximity to the earth since 2003 just the day before (July 31), August opens with Mars retrograde still close by, still on high heat, still rolling out the influence of the July 27 total lunar eclipse and gaining added traction from Uranus by square aspect. A spontaneous, instantaneous, impulsive, launch-it transit, Mars/Uranus brings it to life in some cut to the chase, breakthrough, or emancipating way. An important discovery or creative solution could pave the way for faster ground to be gained. At the very least, Mars/Uranus provides good fuel for the start a vacation or for taking a break. **All times listed are PDT, please check your local time. Venus enters Libra on August 6. Featuring social, moral, legal, and economic matters, this is a particularly important Venus transit, not only for Libra folk, but for all of us. Due to an upcoming retrograde cycle (mid October to mid November) Venus will extend its tour of Libra through the start of December. Uranus, travelling in Venus ruled Taurus, stations retrograde on August 7. Both transits turn up the sound volume on an evaluation process. What do we expect, what can we expect? Can we survive this? Materially, emotionally, morally, is it worth the price? How enmeshed have we become? What’s acceptable? Can middle ground be found? These questions and more will stay front and center through the end of the year. Mars entered Aquarius on May 15, the same day Uranus, ruler of Aquarius, entered Taurus. On June 26, Mars in Aquarius turned retrograde. July through September, Mars travels out of bounds (surpassing the latitude of the sun’s travel in the Tropic of Cancer.) When in this condition, we see more evidence of the planet’s individualizing mandate. Mars out of bounds intensifies emotional subjectivity, personal will, and self assertion. The transit widens the perspective/the divide between the experiential and evolving desires, between the past and the present, between self and it or them. Continuing to stoke the fire, Mars OB provides greater cause to fight on behalf of self in a more proactive way. On August 12, Mars revisits Capricorn, re-visiting the ground it covered in the middle of May. On August 27, Mars will end retrograde in Capricorn, the sign of its exaltation (an optimum access condition). It will spend a few more weeks Capricorn, the sign of its exaltation. This sets up an optimum access condition, allowing for better opportunity to authenticate, legitimize, build it, cement it, and/or get it under better control. On September 10, Mars will leave Capricorn and trek into Aquarius again. Mars usually spends 5 to 6 weeks transiting a sign, but due to this retrograde cycle, Mars will not leave Aquarius until November 15. What are you getting out of it/what aren’t you? Can you make a good thing better yet? Are you standing in your own creative centre? If not, why not? Mercury in Leo, continuing in retrograde motion until August 19, keeps the attention and introspection focused on pleasure and play, satisfaction and happiness levels, self interests, and the heart journey. The last solar eclipse of the year happens at 18:42 Leo on August 11. A fertile new manifesting/creative cycle begins, it is one that is teaming with new life. Solar eclipses tend to generate outer world action. They can typically produce the sudden and unexpected. You may notice some connection to what transpired at the end of January and the middle of February, as the current transit of Mercury retrograde re-triggers the eclipses from the start of the year. (In fact, it is also re-stimulating the great American Eclipse of August 21, 2017. The eclipse forms a dynamic aspect (square) to Juno, the contract asteroid. Cords and ties can be cut, agreements and promises can be broken, new contracts are written. It’s a great time to renew your allegiance to yourself and your greater good, to rewrite your own contract. This eclipse can speed up your personal reinvention timeline. Watch for someone or something special to exit or enter your life, or to get your life moving in some unexpected way. The eclipse prompts a major adjustment, to thinking, to expectations and action-taking. For some, the eclipse can be life altering. Again, please remember that the eclipse must make a direct contact to your chart for it to be of significant influence, otherwise it will simply come and go. Remember that their influence extends over a length of time. The summer eclipses will stay triggered through November. Mercury ends retrograde on August 18. Mars ends retrograde on August 27. September 4,5, Mercury will trigger two notable previous eclipses: August 21, 2017; February 15, 2018. Heading for more of the same? Not likely. Fresh air, a vacation or at the very least, a break in the routine can only do you good. Take more time out for yourself, for whatever turns your crank. Whether you aim get yourself plugged back in, or you look to move yourself in a new direction, Mars/Uranus are on the get-it-moving fast track at month’s start. Mercury retrograde is a good transit for putting pleasure, play and self interests first. Both Mercury and Mars retrograde take you through more questioning regarding what and who is in your best interests. You’ll gain plenty of help from the stars to move you along. The solar eclipse in Leo on Aug 11 can give you a sense that destiny is calling the shots. A contract, karmic or actual, is up for renewal or termination. Some one of significant can enter or exit your life or thrust the action switch in some other way. The week prior to the eclipse or the eclipse itself can get the action up and rolling but know that the Mars transit, Mercury retrograde, and the eclipse continue to run on a time extension. August 12 to September 10, Mars in Capricorn puts a more serious spin on build it better ambitions. The eclipse can revitalize you where it holds the greatest impact – your heart, the center of your being. It increases the potential for greater personal or career success and it can enhance your artistic or creative expression. For some, the eclipse can spark a new passion or a new love. One more eclipse to go! If you were born on or near May 7 -9, you are likely to see the workings of the solar eclipse of August 11 in a catapulting way. Mercury retrograde is of influence for those of you born later in the month. Make an active choice or watch the stars hit you up; either way, it is time to take on a new life. In opposition to Chiron just before the solar eclipse, Venus makes you aware of this fact. The solar eclipse can be the start of a new home life chapter. A new address or new relationship status can be in the mix. You could welcome an addition to your family or say goodbye to someone. The eclipse also favours all personal improvement mandates (i.e. health, wealth, and happiness). A new career or money maker can be in the works too. The end of Mercury (Aug 18) and Mars (Aug 27) retrograde set the stage for you up to make greater progress. Mars retrograde backs into Capricorn from August 12 to September 10. This call the shots, get-it-under better control transit can be especially helpful to those born May 18 to 20. Life/getting yourself where you want to and need to be – it’s an unfolding process. Expect August through November to keep you/it moving along. The start of the month can get you going on something else, something extra or more. Perhaps it is just a sense that you need to get yourself plugged back in, or that you need to make the time you spend add up to more. This describes the influence of the total lunar eclipse of July 27 and Mars/Uranus on August 1. Mercury retrograde, continuing to August 18 can put you back in touch with folks. Use this transit to resume talks or creative projects, to renew a lease, etc., or (- and more importantly-) a promise you made to yourself. Mercury retrograde can also call added attention to on a loved one or another important individual. Thanks to the workings of solar eclipse in Leo on August 11, there is an opportunity to take this relationship or relationship matter in a new direction. Regarding a relationship, a lifestyle, or career trajectory, August 7 to 10 can move you through plenty, inwardly or outwardly. If it isn’t a win/win, its time to end the contract and to try a new life on for size. Mars revisits Capricorn from August 12 to September 10. The retrograde portion of the transit ends on August 27. The transit could produce a financial or emotional drain. On the other hand, you could gain through the end of season prices or a more realistic approach. it is a good transit for rebuilding and recommitting yourself, inwardly and outwardly. As the month and the next season moves along, you should feel you have a better handle on things and that you also have something more substantial to work with and to bank on. There is plenty going on inside you, perhaps even more than you are consciously aware of. Mercury retrograde puts you back in touch with yourself in some significant way. Mars retrograde, a pull back and regroup influence, provides the opportunity to gain better objectivity. Perhaps the transits will force you to do just that. Mars and Mercury retrograde, and the solar eclipse of August 11 put concentrated attention on your livelihood and keeping it alive – at all levels: passion, interest, opportunity, romance, creativity, physical, mental, and emotional wellbeing, etc. Through the process you may discover new inner resources, a special skill or even something extraordinary about yourself. Mars backtracks into Capricorn from August 12 to September 10. You can feel this as added pressure or restriction. To the plus, Mars in Capricorn helps you to get real/get down to business, re-prioritize, and to build something more tangible. Even if life is on the line, the concentration in Leo keeps abundance in the realm of the possible. Noting the stars, potentials abound. It is up to you to see them as such. While a windfall could be possible, you are better off to be pro-active and to create the abundance for yourself. If your birthday is on or near July 27 (the lunar eclipse just past) or August 11 (the solar eclipse on the way), then you could be in the thick of living it large. Although recent times have dished up more, you have likely had your hands full for some time. That’s because the karmic axis has been featuring your sign (north node in Leo). It’s an eighteen-month cycle with just a few more months to go. Mercury retrograde, and Mars retrograde can put you on a time extension and/or delay your full steam ahead. You have more to review, more stoking and refueling to do, more ground work to lay before you hit full tilt. No matter how small or how overwhelming, appreciate the gifts of the moment. They are your best teaching tools. The solar eclipse on August 11 brings an important contract, actual or karmic to a transition threshold. Something of importance ends. Something of importance begins. The eclipse (and the last one) can start you on a new career, material or personal life trajectory. Off with the old, on with the new. Even though a substantial commitment is required upfront, you know in your heart that you are working toward long term gain. Time out or time away is a healing balm. Even so, you may find it hard to relax, especially when Mars retrograde in Aquarius keeps your attention focused on the short falls and missing blanks. The Mars transit also keeps you thinking about work and health. Are you getting anywhere? Are you in the right job, the right field? Is there a quick fix? If you can’t figure out how to improve your lot just yet, to start on this train of thought is productive. Change is your best option. Keep exploring. Something will make its presence known. August 6 to 11 can be somewhat of a challenge. The consciousness raising solar eclipse on August 11 may play out as a subtle background or undercurrent influence. It can give you a sense that you are now ready to take the plunge, that you are crossing a significant time-line threshold. The eclipse can turn a potential into a reality. In general, it sets more fertile backdrop for matters of heart, for personal fulfillment, a creative process or undertaking. That may or may not spell actual attainment of heart desire, but at the very least, the eclipse prompt should prove inwardly informing and clarifying. (It also sets a fertile backdrop for those wanting to conceive.) The eclipse can see you work your through a relinquishing and surrendering process that serves a higher purpose and/or your greater good. Although the eclipse acts a seeding or a starting point, know that what comes to life on the inner circuit board will take a length of time before it plays on the outer screen. Mars backs into Capricorn from August 12 to Sept 10. The transit can help you to gain better ground on yourself. Watch for something more solid to go on. By the end of the month, the retrograde brakes come off. You should have no trouble getting yourself up to full speed again. Venus enters Libra on August 6. This is a particularly important Venus transit, not only for Libra folk, but for all of us. Personal and social involvements, trends, politics, and money matters will stay dialed up through December. As soon as Venus enters Libra, she makes the rounds with Mars retrograde (trine August 6), Chiron (opposition August 6 – 8) and Saturn (square August 9). Venus could launch an evaluation process or Venus can get the action going; either way, you are likely to find yourself working your way through something important (a soul priority, a personal one) in the days leading up to the solar eclipse on August 11. The solar eclipse in Leo on August 11 can produce a special event, unexpected opportunity, or mark a good time to start a vacation. More importantly, it sets an optimum backdrop for lifestyle reinvention and fresh starts. If the eclipse makes an important contact to your chart, it can launch a fertile, perhaps even an exceptional, manifesting cycle. Too, it can enhance creativity, spark your special brand of genius, pump up success potentials or financial prospects. Win some, lose some; endings/exits and beginnings are also in the mix. Even so/over all you stand to gain. The eclipse could introduce you to a new passion or a new love. Someone or something to take your life to a new level. Mercury retrograde can reconnect you with folks you haven’t seen for awhile. Plans can change, minds can too. Mars retrograde revisits Capricorn as of August 12. It will finish its retrograde cycle in this sign on August 27 and continue through Capricorn until September 10. This revisit can make you aware of how precious time is and how little there is of it to waste. Ambition looks good on you. It’s a good transit for getting your house in order (figuratively, literally) and for getting yourself back to work. One more eclipse to go. This one will be of impact if you are born on or near Nov 9, 10, or if you have planets that are triggered by the eclipse. Otherwise you’ll see its workings in the world around you. It is a time to breathe new life into it or to build yourself a whole new personal life reality. The eclipse can signal the start of a significant/important new career chapter. It could bring you to a professional high point. Creative projects are favoured. Karmic or actual, a contract can end, a contract can begin. Mercury retrograde is a time to explore how you can build on a previous success. The transit puts added attention on strengthening your status, your market visibility, your boundaries, reputation, legal position, or relationship – to someone influential (i.e. a boss, important client or an authority figure) or to someone important to you (i.e. a lover, parent, child, trusted friend, advisor, agent). Significant added responsibility is in the mix regarding a new position, status or role, but a hefty investment (of time, effort, money, or heart) is likely to be something you’ll see as valuable or worthwhile. Mars in Capricorn, travelling retrograde from August 12 to 27, direct from August 27 to September 10, is a productive transit for getting your plans and commitments sorted out. It can be a month of special events, special meet-ups, or reconnections. As is typical of the transit, Mercury retrograde can bring special people back into your life or take you on a temporary adventure. Take a vacation, spend more time in nature. It’s a good transit for getting back in touch with what really matters, i.e. life, love, laughter, the spiritual side, etc. The solar eclipse of August 11 sets the future and the heart into motion in some notable way, especially so if you are born around December 9, 10. One door closes another one opens. The eclipse can see you make an important breakthrough and/or it can jettison you over a no-turning-back threshold. It can move you in a new direction regarding health, a job, a money matter, or relationship involvement. The eclipse is laden with potential. Surprise can be in the mix. Watch for news, an announcement, or a gift (it could come in a package or as an opportunity). Relocation can be a great way to restart your life. Travel, teach, perform, create, love, live it large. Call it luck or call it fate, no matter what initially transpires, things have a way of working out to the plus. August opens with the total lunar eclipse of July 27 still triggered. Mars/Uranus will prompt you to hit the ground running, pull the plug, or take a well-deserved break. Mercury retrograde, continuing to August 18, can dish up a rehash or a revisit with someone who tugs on your heart. Memories of the past can get your attention too. What do you want, what do you need, what/who makes you happy? Are you thriving? Mercury and Mars retrograde also keep you deeply entrenched in self examination. Both transits prompt you to put your own wants and needs first (rightly so). Gift yourself more, you deserve it! With a short revisit of Capricorn from August 12 to September 10, (especially energizing for those born January 18 to 20) Mars will continue to push you through an intensified personal and material reinvention process through the middle of November. By October-ish you should feel that you are picking up good speed, that you are able to cut to the chase or cut yourself loose. The solar eclipse of August 11 can be wealth generating at all levels – emotional, material, creative, and financial. For some, it can fire up a new love or passion. For others, an ending could be to the greater good of all. The eclipse sets karmic and actual contracts onto a next term. Please remember that the eclipse will simply come and go as more dynamic new moon (favourable/lucrative for fresh starts) unless it makes direct contact to your natal chart. August opens with Mars/Uranus on a cut-to-the-chase or hitting a next page. Between now and September 18 when they’ll meet again, you’ll be working your way toward a next springboard. The July 27 lunar eclipse is still hotwired, especially for those born on or near January 22 to 26; it will continue to keep triggered for some time to come. Keep alert, something could get you up and rolling unexpectedly. Mars will dip out of Aquarius from August 12 to September 10. This backtrack to Capricorn is ideal for taking more time out to replenish and to get yourself sorted out. The transit serves to provide you with a better feel for what’s real/viable, and what’s not. While both Mercury and Mars retrograde are good for a pull back and regroup, one way or another, Mercury retrograde can also see you get reacquainted or reconnected. Someone special could make a reappearance. You may have a chance to revisit the conversation, to say your piece, or to move the unfinished business to higher ground. The transit can also call for you to renew a loan, lease, contract or agreement, to redo important paperwork, to revise plans or expectations. The solar eclipse in Leo on August 11 spotlights key relationships – with the public, your clients or social life, and most importantly with a special someone. For those who are single and on the look out, it is within the range of possibility for the eclipse to launch your next karmic contract. If it doesn’t deliver now, it can deliver anytime in the coming months – or even longer. More importantly the eclipse begins a new cycle of the you “out there”. It is about upgrading how you represent for yourself. The eclipse is a consciousness raising influence. While you are the author of your destiny, the eclipse also sets a backdrop to set karmic wheels in motion. Some contracts are meant to end, some are meant to move to the next level. If you are at a fruition stage, the eclipse sets you up for more notoriety, more favoured attention among your peers and peeps, more accolades or prestige in your outer world dealings. Of course, how it plays out for you depends on how the eclipse and the rest of the stars line up with your chart. Healthy mind, health body, healthy heart – do yourself some good, make it a priority. Mercury retrograde (to August 18) can take you through an important rethink or revamp. Keep renovation projects simple, don’t over do it or Mercury retrograde could produce cost over-runs. On the other hand, don’t feel guilty about spending to make yourself happy or well, about gifting yourself or putting your own needs first. Don’t scrimp on advisors or advice. Make sure you hire the best agent or practitioner too. Mars retrograde can keep your mind busy, your heart too. Mars in Aquarius gives you plenty of extra time to soul search, to do an inner re-group. Both Mercury retrograde, and Mars retrograde (especially while in Capricorn from August 12 onward) can get you reconnected. Both can prompt a change of opinion, mind, goal, or plan. For the most part, it’s a natural progression. The solar eclipse on August 11 could put something unexpected in front of you. It could be an added expense, a repair, a vet bill, or some other problem you didn’t see coming. Or the eclipse could pave the way for an improvement. Watch for a new work or work it out opportunity, a new solution, a new health or physical fitness program that could do you great good. You could find better help (a new doctor, agent, teacher, training program, etc. ), stumble upon a better solution. At the very least, the eclipse and the rest of the August stars will get you thinking about making the improvement you know is so necessary and desirable. Encompassing the start of Virgo month (August 26, a full moon in Pisces August 26 and the end of Mars retrograde on August 27), the end of the month is sure to keep life in full swing.